At yesterday's Aliens and the Imagination event at the British Library, David Clarke mentioned that the first non-fiction book on the UFO phenomenon in the English language was Gerald Heard's The Riddle of the Flying Saucers (1950)... and went on to suggest that most people had probably never heard of it. Actually I had heard of it, but only because I'd read about it in a book co-authored by David Clarke himself (Flying Saucerers , written with Andy Roberts). I even bought an old copy of Heard's book in a second-hand bookshop a few years ago... and promptly forgot all about it because it was so unmemorable! The Flying Saucers are Real , which appeared later in 1950, and is the work of Donald Keyhoe -- a former marine who, back in the 1930s, had been a prolific writer of pulp fiction, producing tales of the First World War flying ace Philip Strange, and the scheming Fu Manchu clone Dr Yen Sin. The significance of Keyhoe's book is that it was the first to suggest the now-indispensable idea of a government conspiracy to cover up the truth about UFOs. Flying Saucers Have Landed (1953), written by Desmond Leslie in collaboration with the first "contactee", George Adamski. Although the book is best remembered for Adamski's contribution, Desmond Leslie was the more thoughtful and erudite of the two authors, and his ideas on Atlantis, the Pyramids and ancient Indian flying machines (vimanas) were the first of many attempts to link modern UFO sightings with ancient mysticism. In comparison with these two books, Gerald Heard's The Riddle of the Flying Saucers offers nothing to get the pulses racing -- no government conspiracies, no alien abductions, no ancient astronauts. Instead, in a series of breathtakingly glib deductions, Heard progresses from the small body of observational evidence to the conclusion that Flying Saucers are piloted by intelligent bees from the planet Mars. These aren't even giant bees -- they're just slightly larger than ordinary earthly bees (about two inches long, Heard tells us). If this all sounds too ludicrous to be taken literally, I suspect that's because it was never meant to be taken literally. 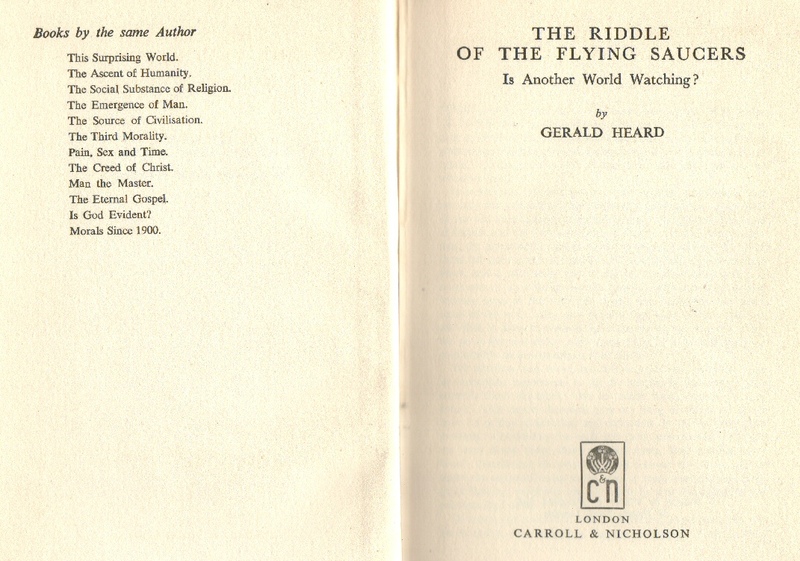 If you look at the titles of the other books written by Gerald Heard (as seen in the scan on the left - click to enlarge), they all seem to be on religious or moral subjects. While The Riddle of the Flying Saucers doesn't contain any overtly religious ideas, it's got more than its fair share of moralizing. The Martian bees don't like humanity's preoccupation with war and nuclear weapons, and it's a safe bet that Gerald Heard didn't either! It's reasonable to suppose that he picked on flying saucers, as a currently fashionable subject, simply as a convenient vehicle to get his message across. In which case, it's only fitting that the book fell into such total obscurity! Incidentally, my copy of the book (which I bought in Sherborne, Dorset) has a hand-written inscription inside the front cover that says "To Desmond from Mother - Xmas 1950". Maybe it was Desmond Leslie's personal copy! Wait a minute...Gerald Heard? I know that name. Isherwood, right? Or mysteries? (Google fu!) Yes, thought so, he was Isherwood's intro to Vedanta, the guy with the pointy goatee. Oh, and he also wrote mysteries; he was H.F. Heard. And, whoa, that's weird - he gave the AA founder LSD...And, hey, his story "A Taste for Honey" inspired the B movie "The Deadly Bees!" You should look into this guy more. He has layers. 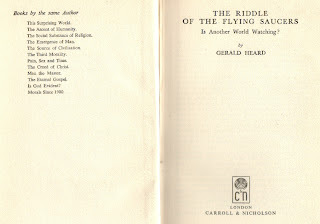 http://www.geraldheard.com/ However, "The Riddle of the Flying Saucers" is not in his Wikipedia article. Quite right! There was a bit of a discussion along these lines on Facebook yesterday when I posted this via Networked Blogs - the first comment coming from Andy Roberts, who was David Clarke's co-author on Flying Saucerers. You're absolutely right that I should have done more research before launching into the post... my defence being that it was a spur of the moment thing prompted by something I heard the previous evening. A couple of the things you mention came up - LSD and A Taste for Honey. The latter is interesting because it too features bees -- not as visitors from Mars but as a murder weapon in a detective story (used twice, by two different people, if I understand correctly). Julian Symons, in Bloody Murder, describes the novel as "long-windedly philosophical", which suggests that I may not have been too far wide of the mark when I said that Heard was a bit of a moralist!